Between Abraham and the coming of the Messiah, there stretched an age spanning two thousand years. Sadly by the time Israel had realised this prophetic fulfilment, she had degenerated to an all time spiritual low. As a consequence, the Lord Jesus Christ was provoked into a scathing condemnation of Israel's leaders, labelling them, among other things, “white sepulchres” and “wolves” “in sheep's clothing”. They had no room for God's blessed Son and despised His “narrow way”. The reading of this little book will shock you for you shall discover that the church in general is today under an even greater blindness than was Israel. 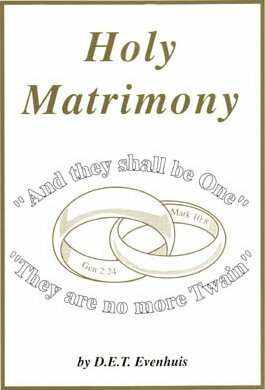 Nothing upon Earth typifies Christ and His church as does "Holy Matrimony" and nothing is under greater attack.